Source: Make Life Lovely. 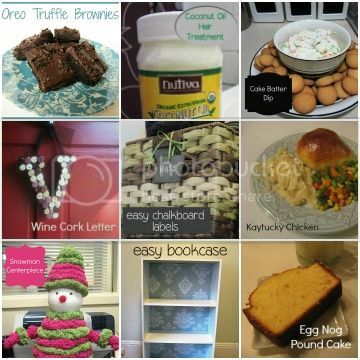 Laura has a lot of fun ideas on her blog, you should check it out! I already had baskets lined up across the top shelf. The problem is, while I knew what was in them, Joe did not. So every time he went looking for his gloves or JJ's sneaks, he was pulling everything down and messing it all up. Labels would help solve this problem. While I was at Michaels to purchase my Valentine's Day photo shoot supplies, (seriously, I should invest in Michaels stock), I scanned the wood crafts aisle for something to use. I am not sure what these things are actually called, but they are super thin like those balsa wood airplanes and were between $0.37 and $0.50 each. I already had the paint and ribbon, so this was a super cheap project. This was after one coat. Very streaky. 3 coats - good enough! After 3 coats (that took less than 5 minutes each to do), I let them dry for a couple days. Then I had to figure out how to get a hole in them. I considered letting Joe drill them, but they are so thin it felt really silly to go through all that trouble. So I decided to try my heavy duty three-hole puncher. The hole came out a little larger than I would have wanted, but it was quick and easy. Next step was to "season" them. Just rub the side of a stick of chalk over them and rub it off with a paper towel. Just add some ribbon and they are good to go! Hats are all the way to the left. JJ's stuff contains his hats, sneakers, mittens, etc. Flags are seasonal garden flags for out front next to the porch and gloves are pretty self explanatory. You may be wondering about this monster basket and plastic box. Joe is ridiculously serious about emergency preparedness ever since Hurricane Irene in 2011 and Sandy from last year. We are well stocked with D batteries, extra light bulbs, flashlights, extension cords, and his work gloves and instruction manual for our generator. Its all kept here in case we (he) need to spring into action. There are command hooks on the door to hold JJ's little coats. They tended to get lost in between our coats when they were on the adult sized hangers when I tried to hang them up on the bar. I keep our vacuum, carpet steamer, and the shoes we use most often in the bottom. Like I said, super easy project that probably cost me less than $5 and an hour collectively. I have a bunch more made and ready to use once I get the organization bug again and attack another closet. Looking at these pictures, I am thinking it might be fun to paint a different color in the back of the closet. Or maybe a stencil? It looks kind of boring, right? Thoughts? 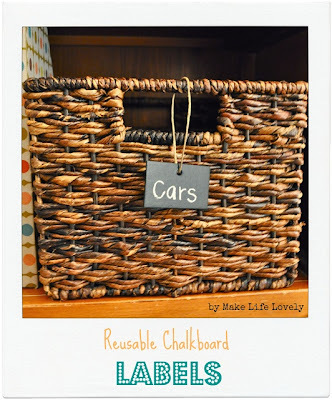 I am linking this up to the Pinterest Challenge and I think Shannon is linking up her awesome Book Shelf Upgrade. We can't wait to see what everyone else comes up with! I love when organizing looks trendy! Great project! Thanks Stacey. 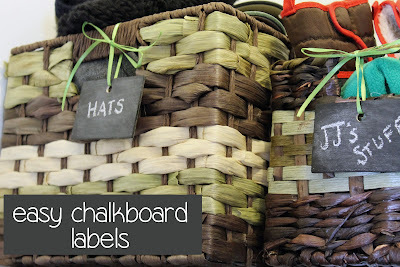 I was afraid the chalkboard trend was dying out (ala "put a bird on it"), but I am glad to see other people are still into it! I literally JUST bought some of that chalkboard paint on Sunday with absolutely no purpose in mind. I just couldn't resist! This has given me some inspiration! Great job! I am a sucker for anything Martha Stewart too so I understand the impulse purchase! Your desk re-do looks great Vanessa!